Have an up-to-date view of how long you might have to wait for your Review. Review Times is a small application that places an Icon on the Menubar. 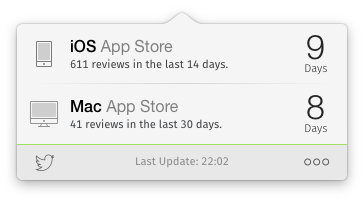 When you click on the Icon a Popover is presented showing the calculated review times for both the Mac App Store and the iOS App Store. All data is retrieved from appreviewtimes.com. 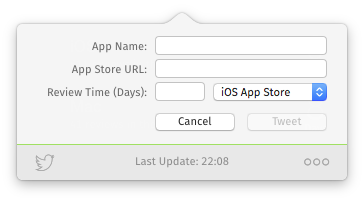 You can use Review Times to submit your own app review times by sending a tweet - right from within the app. Just click the Twitter Icon or use the shortcut ⌘S. Review Times also provides a simple and clean Today Widget. It gives you the same information as the popover window. In the preferences you can customize the behaviour of Review Times. You will be able to configure if Review Times should launch at Login, and whether you would like to recieve a Notification Center notification when the review times have been updated. 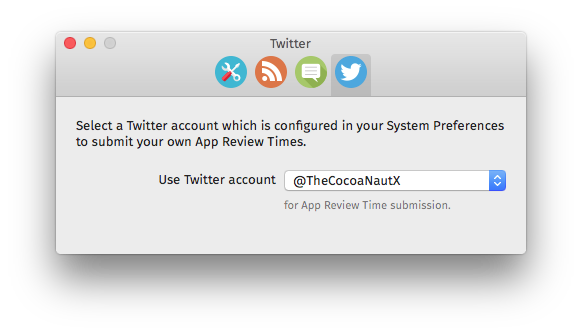 Finally you can select which Twitter Account, from those you have configured in System Preferences, that you would like to use to submit your own review times. Türkçe, Русский, Nederlands, Čeština and 简体中文.